First of all I have to apologize about this review. I’m about to move, and I didn’t have time to do a video review, or to take any of the accessories out of the package. Once I am settled, I will shoot a video review. Head right over to BetaToys and get an Irongear though, you won’t be sorry. One of the best things about Irongear is the fact that it’s pretty much ready to go right out of the box. There are no extra fists or fiddly bits. The box is huge and inside is a full styro tray that houses Irongear and then two smaller trays for the accessories and the Walker Machine kits. Irongear is a hulking beast of a machine. 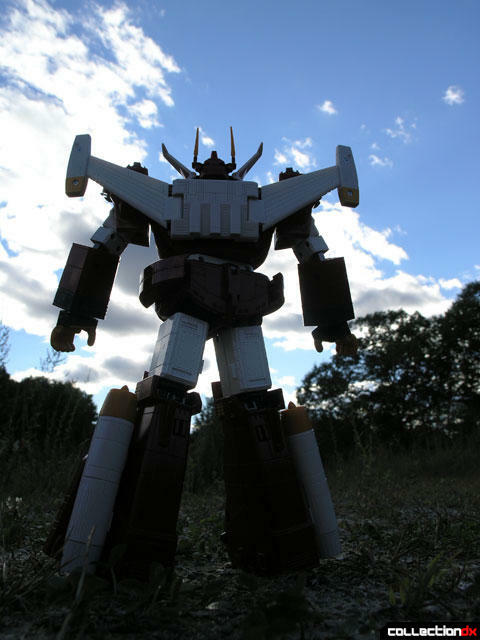 It comes from the anime show Combat Mecha Xabungle (戦闘メカ ザブングル) which ran from 1982-1983. This giant Landship would carry around the smaller walker machines and when the need arose would transform into the giant Walker Machine Irongear. The toy comes packaged in Walker Machine mode so we will start there. For a big toy, its got a fair amount of articulation. 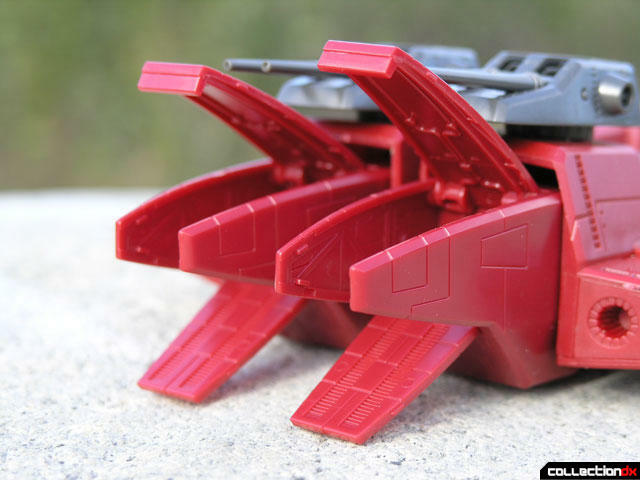 The head turns, and the white fins on the sides are poseable. Each arm is articulated at the shoulder, bicep, elbow and hand. The hands feature a poseable thumb and finger group. There are no extra hands here – one hand does it all. The upper body is mostly metal. 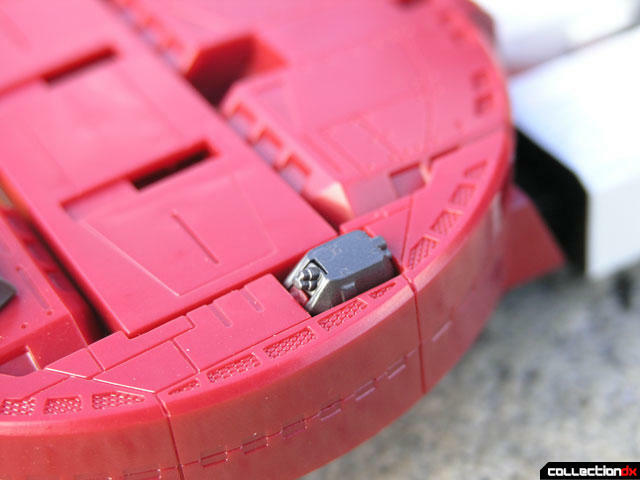 Irongear has a waist joint, and parts of the waist are also metal. 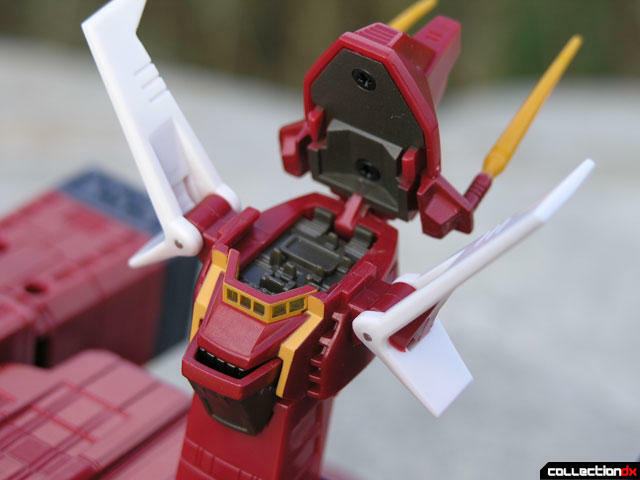 The legs attach to the body with an innovative connection system that accommodates both a full range of motion and the splitting ability required for transformation. In robot mode, the only real accessory you can use is a head covering – I didn’t take it out of the package but it basically gives the appearance of having a ski mask on. 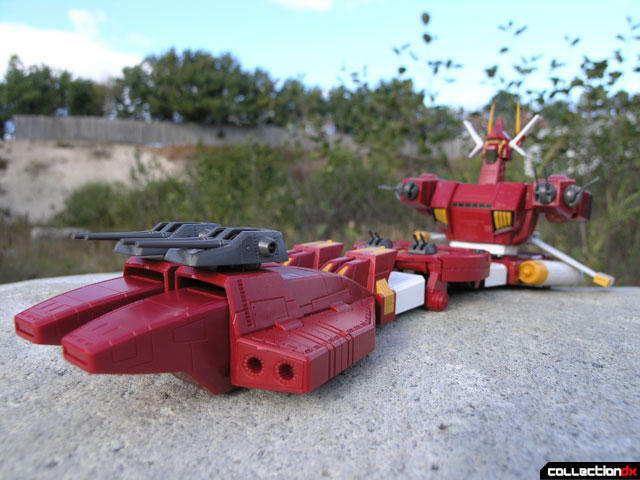 Transformation from Robot mode to Landship mode is essentially the same as the vintage clover DX toy. You have to remember that most of these characters were designed as toys first and then the show was designed around them. In order to make the character on the screen look just like the toy, they had to make sure the transformation was accurate. 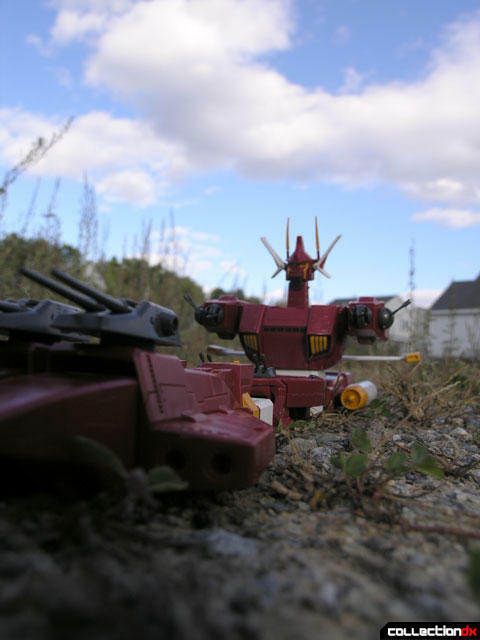 Bandai did manage to do a few things differently than Clover did though, and this toy is more awesome because of it. 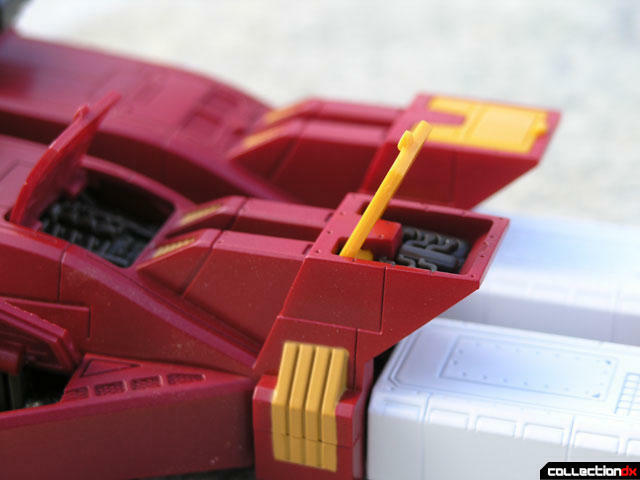 The first thing you need to do is push the fists up into the arms, and a neat feature here is that a side panel slides up to cover the white part of the arm. From here you have to do a few things at once, but it all comes back together nicely. First you separate the waist and you notice the large metal supporting bar. When this is separated, pull the side parts of the waist out and then separate the legs down the middle. Now while each leg is split in half, the two halves on the rear need to separate. Swing the rear legs back and the metal supporting bar will go in between the legs and then the legs snap together locking it in. Swing the front pegs forward then push the two sides of the waist back in, locking them in place. 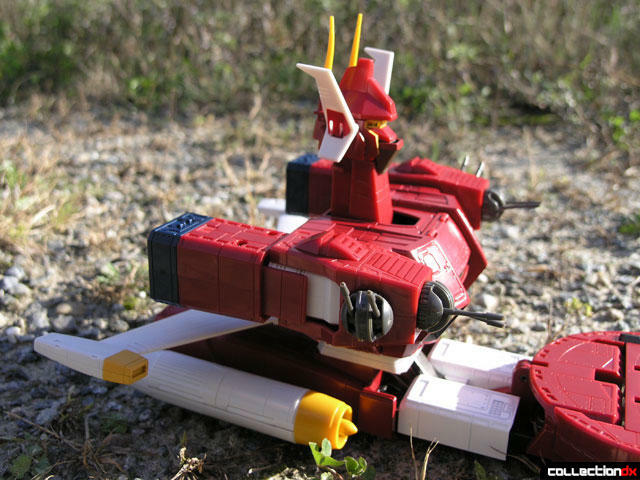 Push down on the chest part so it snaps into the back of the rear legs, and then pull the head up so it creates a tower. 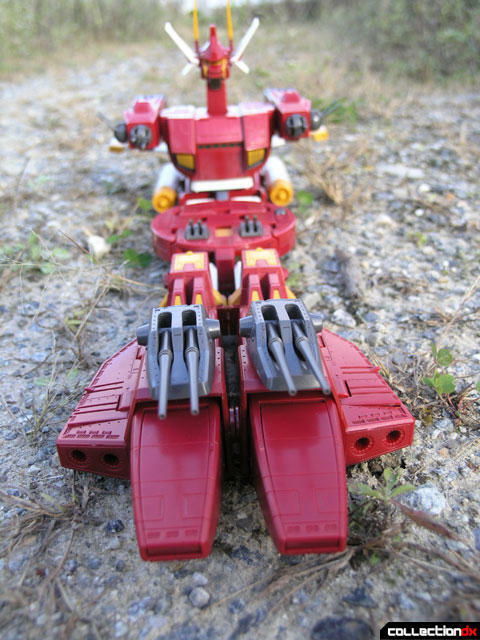 Unfold the front feet and there you have it – Landship! It is in this mode that the Irongear really shines. Let’s start at the front and work our way back. The two “feet” in the front open and provide access to the interior of the ship. The large cannons can rotate and each barrel can move independently. 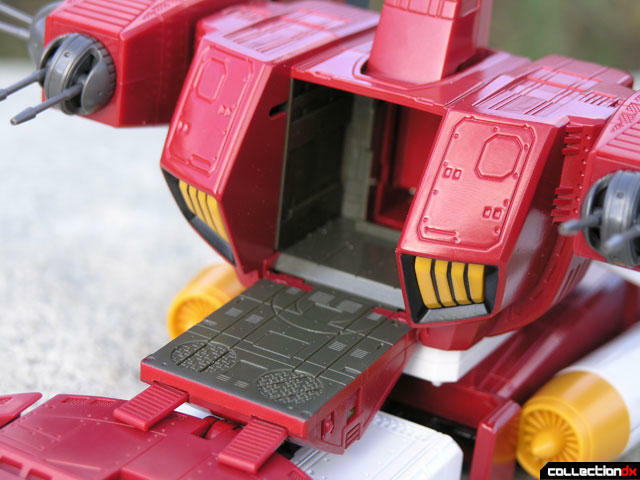 The panels on either side can be opened to reveal the inner mechanisms of Irongear. There are also 2 panels on the top of each leg that can be opened. Moving to the midsection there are two canons that rotate in addition to a hidden cannon on the side. A large door opens on the lower bridge for storage of the Walker Machines, This door also has 2 ramps that extend from it. Inside you can put your choice of two backing panels for added realism. The head at the top of the bridge has a flip open top to reveal the control room. 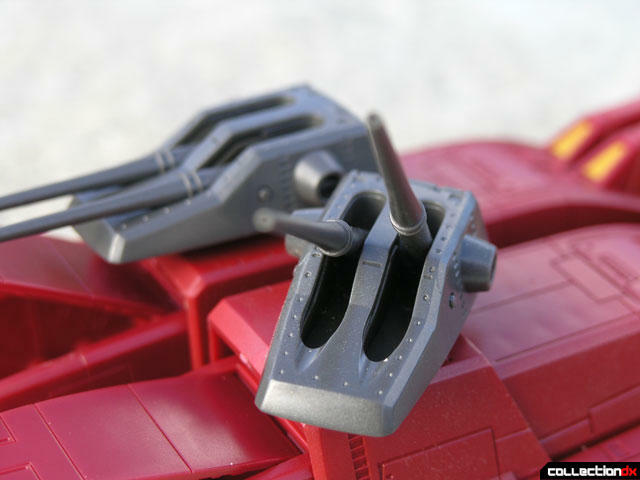 Each shoulder has 2 rotating cannons with positionable barrels. The rear section has large white wings that can be moved a little. 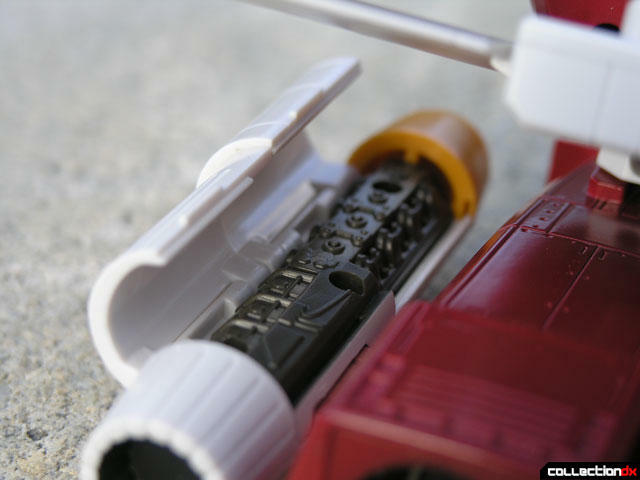 On the rear of each side of Irongear there are two white pods that feature opening compartments where again you can see the insides of the engines. These pods are removable, although I don’t think they are supposed to be. Also included with the Irongear is a model of the landship “Buffalo” and 15 different walker machines that you have to assemble. There’s not much I didn’t like about this toy. 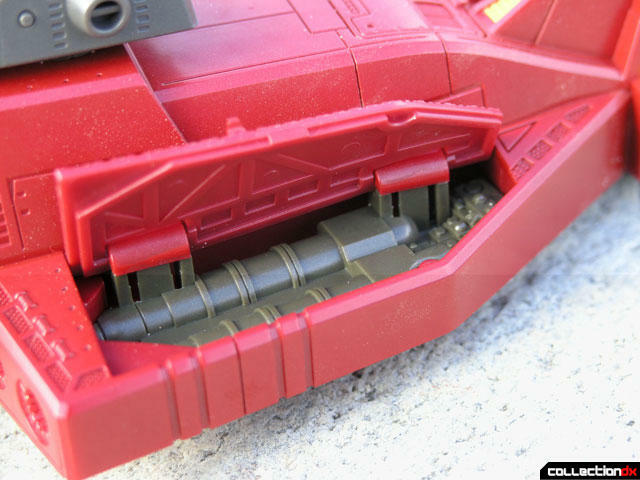 The main flaw is the weight of the toy in landship mode seems to be too much for the joint system in the center. The legs and hind section are too heavy, causing the ship to sag if lifted up. Fortunately, the Irongear was not meant to fly! I also was not at all in the mood to assemble microscopic model kits of 15 Walker Machines. Those are going to stay in the box I think. But Irongear is a lot of fun, and I really love the fact that it is “Ready to go” right out of the box – I can’t stress that enough. It's amazing--the fire truck from the Boukenger/Operation Overdrive transforms almost exactly the same way (with the legs splitting like that), but it has almost no articulation. 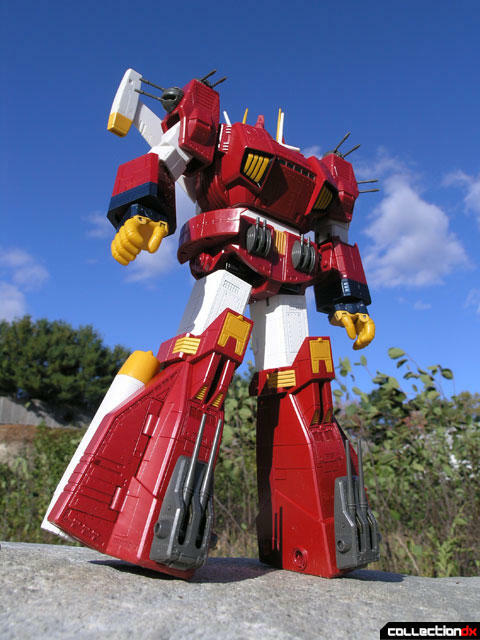 I only wish Bandai would put a tenth of the effort into its Sentai product as it does into SOC. Yes, I know Sentai is meant for kids, but just a little more ingenuity wouldn't hurt. Hear hear! I completely agree with you! Oh, BTW, the DX Kinkyuu Gougou Gattai Siren Builder from Boukenger (aka Flash Point Megazord) wasn't even released in the US. 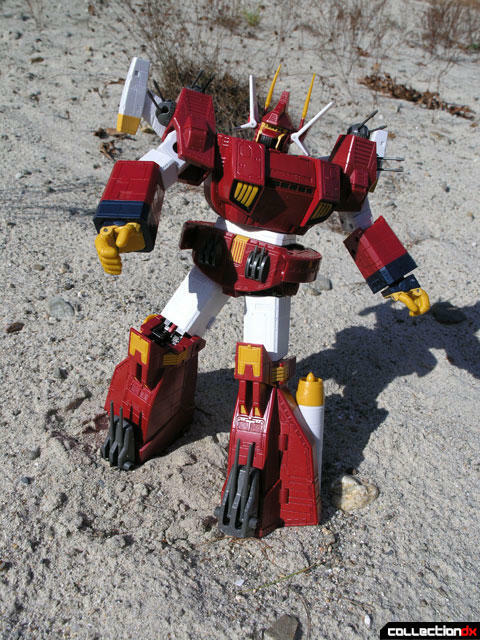 But the DX Chouzetsu Gougou Gattai DaiVoyager (aka BattleFleet Megazord) was... without physical modifications. 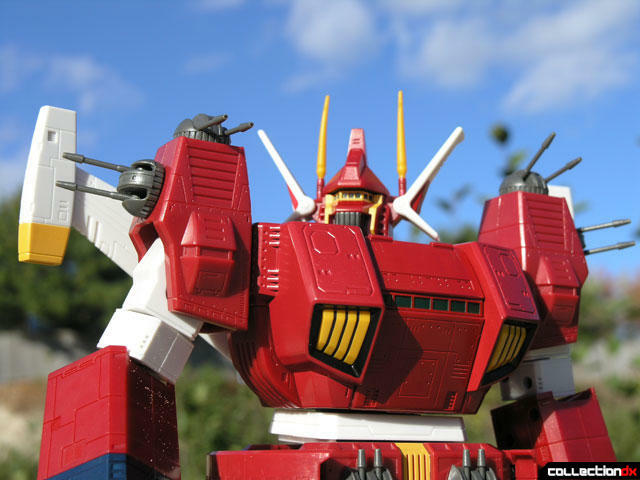 Which means that it is not compatible with the larger remake Deluxe DriveMax Megazord. What in thee hell is BA doing over there!? I agree with the rehashing thing. Boukenger, to me at least, seemed like a massive throwback to 80s Sentai. The costumes and mecha all had that feel. (And maybe this was just in my crazed mind, but the Black Ranger looks like one of the troopers in Spaceballs.) Gekiranger actually looks very interesting and I'll try out the mecha. I've been a Ranger fan since the beginning--the first Megazord was my prresent for my seventh birthday. So I've seen the slide in quality first-hand. Still, PR holds a place in my heart alongside TF. Oh, Boukenger definitely had that old-school feel to it. A lot of people commented on that, and it was supposed to be like that. Actually, I liked that as well, since I am not old-school in my learnings of Super Sentai; having been raised- like Atom Smasher here- on PR first, and then having to backtrack. No, what I was commenting on earlier was that the toys of the mecha were faithful to the designs seen on the show, but were designed rather poorly. Many unanswered questions were left in the wake of the series as far as combinations and functions. 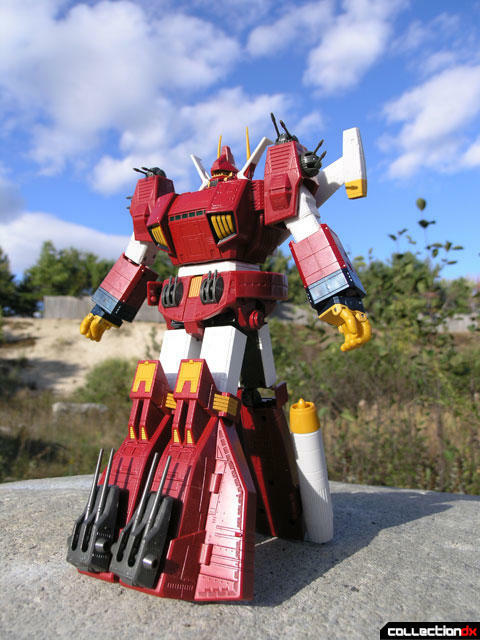 The DX DaiVoyager, by far, was the biggest let-down even compared to the DX Siren Builder. As I said in my review of the DaiVoyager, it's just a big ol' block of ABS with a motor function thrown in at the last minute. Not smart at all, rather clumsy actually. There were some places they could easily have gone with it even without the whole giant-battleship-design thing. Have you actually ever handled the old Clover DX Irongear? It's almost ALL plastic, so the SOC actually in this case adds MORE metal than the original. I agree. I think this is perhaps one of, if not the most vintage style SOC out there. I think most of your complaints would be valid in almost any other SOC review (including Zanbot, actually! ), but I can't agree on this one. I love Irongear. :) Still, I'm not sure how much longer I'm gonna keep getting modern diecasts. There's little to no joy in it for me lately.